Bali is a small and beautiful Indonesian island, and the premier tourist destination within the whole country. Visitors holidaying on Bali will each find different things to remember the island by, such as its expanses of tropical beaches, its local culture and dancing, its extravagant temple ceremonies, and its lush valleys and old volcanic craters, at their best around Kintamani and Munduk. The tourism scene on Bali is spread around the island's main towns and regions, being especially concentrated in South Bali and the resorts of Kuta, Legian and Seminyak. Denpasar serves as the island capital and features some lively markets and information bureaux, while the regency of Karangasem is known for being home to the Mother Temple of Besakih, Bangli for its hilltop views, Kuta for its exceptional beach and party atmosphere, and the more centrally located Ubud for its Balinese culture and mountainous scenery. The beaches of Bali is often where the action is and they don't come any better than those around Kuta, Nusa Dua and Sanur, where you can sunbathe, swim and even surf, although experienced surfers do tend to favour the waves around the Bukit Peninsula. The island's northerly beaches and resorts, such as those around Lovina, lend themselves more to snorkelling and scuba diving, and you can often see dolphins here. Away from the coastline and offering something quite different to the sand, the simply vast Bali Barat National Park is the place to come if you want to immerse yourself in nature, and tour guides strongly recommend an early morning start. 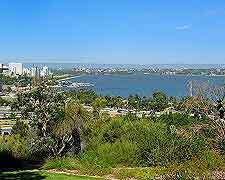 More information about Bali Tourist Attractions. Although many tourists will find it difficult to drag themselves away from the sun-drenched sands, Bali really does offer much in the way of history. The Banjar Buddhist Monastery is one sight to look out for, as is the temple named the Pura Saraswati and the ancient Elephant Cave (Goa Gajah). 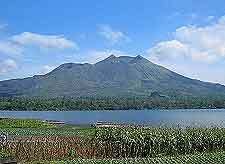 Others will find that the Gunung Batur volcano is an especially interesting site, where Lake Batur has formed in one of its actual craters. 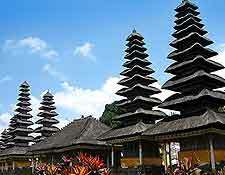 More information about Bali Landmarks and Monuments. A handful of museums are on hand in Bali and ready to furnish you with information about the island's history and numerous earthquakes. The Bali Museum (Provincial State Museum) in Denpasar is amongst the best and most detailed, and contains a wealth of historic exhibits, while nearby, the Museum Semarajaya contains an impressive collection of pottery and relics. If art is more your thing, then head to Ubud, where both the Antonio Blanco Gallery and the Neka Art Museum reside, along with a selection of additional galleries. 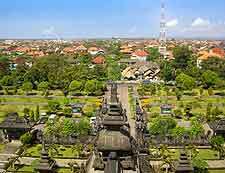 More information about Bali Museums and Bali Art Galleries. Being an island destination, tourists looking for day trips away from Bali will likely find themselves heading off on a boat cruise or plane, to another of the neighbouring Lesser Sundra Islands. 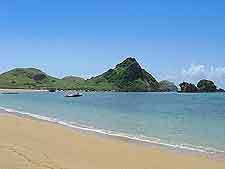 Lombok is a particularly popular island and lies very close by, to the west, with the best places of interest and seafood restaurants tending to be centred around Lombok's city of Senggigi and beach resort of Mangsit. A little further from Bali and also to the west are the islands of Sumbawa, Flores and Komodo, the latter of which is a national park and home land of the giant lizard better known as the Komodo dragon. More information about Bali Attractions Nearby.